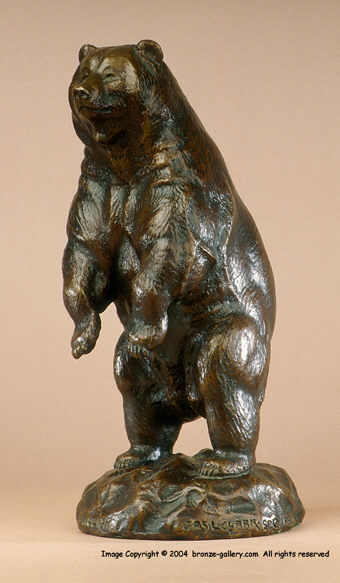 Roman Bronze Works NY Inc.
Clark did many sculptures of big game animals and this model of a Kodiak Grizzly Bear is one of his best works. The Bear has heard something and he is standing up to try to see what it is. A great portrait of an alert wild animal, Clark studied his subjects in the woods and was a master at capturing their moods. This powerful sculpture would highlight any collection of American art or be enjoyed by any wildlife enthusiast. A rare model cast by Roman Bronze Works and finished in a rich brown patina.